ABI Research figures for 2010 are all in and unsurprisingly Nokia still dominate the market with just over a third of the Worldwide market, however Samsung are catching up and account for one in five phones in the market. The ABI Research figures for Q4 2010 make for some interesting viewing. Nokia is still the dominant supplier with 31.7% of the world market representing 453 million devices sold worldwide, and Samsung are hot on their tail with 280.2 million devices shipped, up from 227.1 in 2009. Next up is LG with 8.6% and slightly fewer phones in the market than last year. ZTE make it into fourth place with 4.6%, followed by RIM Blackberry and Apple who both share the 3.5% market share but RIM BlackBerry just pips Apple by 500,000 units with 48 million units shipped compared to Apple’s 47.5 million. 2011 looks interesting. Apple’s latest iPhone assault with its CDMA Verizon version, and it’s very healthy Q4 sales has opened up the market and it wouldn’t surprise anyone to see Apple advancing to within a whisker of 4th place, or even taking the 4th place in 2011. Nokia won’t see any of the Windows Phones this year and sales will probably fall again unless it can pull off some sort of miracle. It will also be interesting to see how HTC progresses in 2010. Their devices are everywhere and as smartphones start to make bigger inroads into the market HTC’s share will inevitably rise. NB – ﻿ABI’s numbers represent “sell in,” or phone shipments into the retail channel, rather than “sell out,” or sales to consumers. 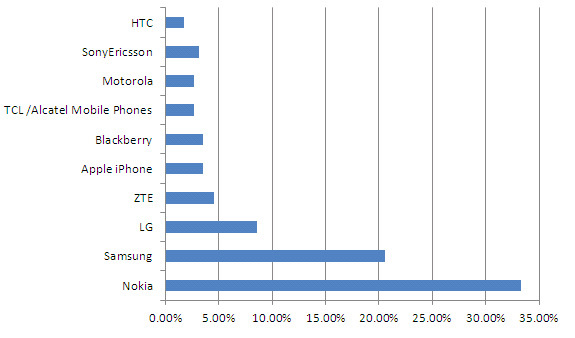 ABI’s ranking also only counts phones that carry the manufacturer’s brand.